I am quite pleased with the purchase since I got 12 rolls consisting 1920 pulls for just rs. 320/-. I see it can be cheaper yet, but this isn't expensive too. I tried and found that it can also be used as glass cleaning cloth. It is so soft it will hardly cause anything undesirable to the glass. Honey I shrunk the toilet rolls! Check the photo, old roll from last lot on left and new one on the right! The quality has deteriorated and the quantity has reduced considerably. I never expected this from origami. This may be the 10th time i have purchased this product but the first time i am so disappointed in the product quality and quantity. The MRP is Rs.320 the seller gives Rs.30 discount then adds Rs.60 on top as shipping charges. What kind of sale is it? Secondly the rolls are much smaller compared to Tempo brand. Anyday Tempo Brand rules in quality, quantity and price. 5.0 out of 5 starsVery soft and strong tissue paper. Pleasantly surprised with this tissue paper! It's strong and so soft at the same time. Much cheaper than what is available at my local shops. Each roll is thick with lots of sheets. At the price of 320 per 12 rolls, I'll definitely continue to purchase this as long as it's available. Edit: why has the price gone to rs.625 when MRP is rs.320?? Good and soft for relatively dry surfaces. Not very ideal for wet surfaces as it is flimsy, thin and dissolves. You may find the tissue shredding and small pieces of paper stuck to surface. Ideal for when you want to avoid irritation or scratches. 3.0 out of 5 starsIt doesn't compare to what you buy in the store. They charge you 330 which is much lesser than what you would pay in the store for 12 rolls. But the size of each roll is about half the size of what you would get in the store. So you're really paying the money for 6 rolls which sums up the same thing. The quality of the rolls could also be a lot better. This is something they should consider using a box for as the rolls get pressed during travel and handling. Will I buy it again? 2.0 out of 5 starsSheets reduced. 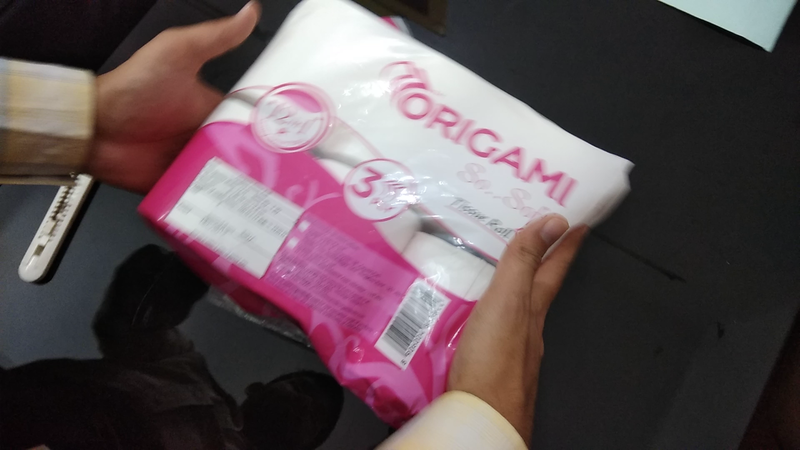 I've been using Origami 3 ply tissue rolls since more than 6 months now and they've been good, but the recent purchase has really disappointed me. These tissue rolls have definitely been reduced in the no. of sheets/pulls. They are not at all tightly wounded but very lose, thus compromising the company's promise and goodwill. Jackson Toilet Tissue Paper Roll - Pack of 10 Rolls - 270+ Pulls/Roll GUARANTEED!